Apollo 13 launched on the 11 April 1970 at 7:13 o’clock in the evening with flight crew James A. Lovell, John L. Swigert and Fred W. Haise. Lovell was the Commander of the space flight, he had previously flown to the moon on board Apollo 8. 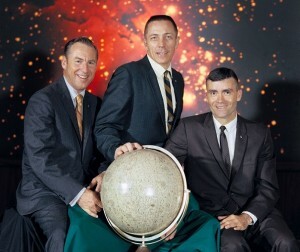 Swigert was the Command Module Pilot and had been a member of the backup crew until the week before Apollo 13 took off. While Haise was the Lunar Module Pilot and was due to be the sixth person on the moon before disaster struck Apollo 13. On Thursday October 15, 1970, all three of the Apollo 13 astronauts, Lovell, Haise and Swigert, arrived in Limerick city on the last leg of their European tour. The day before the three landed in Shannon Airport, and later spent the night in Dromoland Castle. The space men arrived in Limerick from Dromoland at 11.15am. They traveled by motorcade via Ennis Road, O’Connell Street, the Crescent and Barrington Street and concluded their procession on Pery Square. They were met at then City Library, now Limerick Gallery of Art, in Pery Square, by Mayor Clr. J.P. Liddy and were treated to a civic reception. That being said, at least one of the students in attendance received more than just an autograph. Fifteen year old Brian English, “a student at St Munchin’s College, who this year was the best boy in the Aer Lingus sponsored Young Scientist of the Year competition”, got to chat with the astronauts for several minutes. “Few of us, indeed, will ever forget the tense drama in which we became personally involved, as we followed your flight for survival through all its stages, on our television screens, All the destructive forces of nature combined to create a nightmare situation to which no human beings had ever before been exposed. While we must pay the highest tribute to the American technologies and scientists at Houston and other stations, who strove against overwhelming odds to bring the crippled space ship back to earth, their best efforts would have been in vain but for the courage, resourcefulness and steadfastness of spirit which the three of you displayed. Following the reception, the party and the Mayor left Limerick via Pery Square, Mallow Street, O’Connell Street, Henry Street and Sarsfield Street to Bunratty Castle. This visit came only days after a visit to Limerick by the American President Richard Nixon.